All things being equal, Bridgeport Coach Dennis Hutson would like to see his team’s 14-7 record with a few more wins and a few less loss. However, Hutson has been around long enough to know that now’s the time when you want to be adding more numbers in the win column. His Lady Indians team is doing just that. Bridgeport picked up three wins in the last five days. More importantly, the Indians have now won six straight contests. The biggest of those wins came Wednesday. The Indians avenged an early season home loss to Harrison County and Big 10 foe Lincoln. Bridgeport overcame an early deficit and rolled to a 50-31 win against the Cougars after falling to them at home just before Christmas by a 38-32 score. Along with that win, the Tribe picked up a 63-47 win at home Saturday against Braxton County on senior night. The team came back Monday to roll past Robert C. Byrd by a 56-25 score. Against the Cougars Wednesday, the Tribe found themselves down 11-4 in the first quarter before Rory Marple took over. 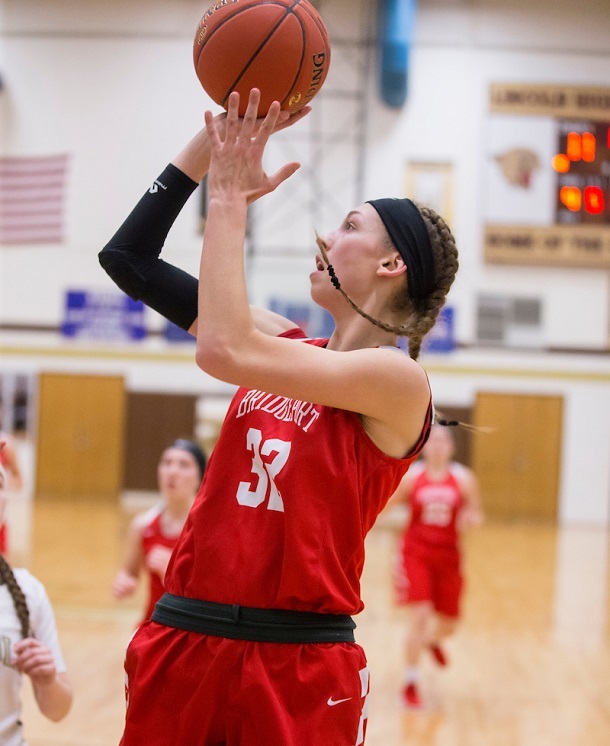 The senior turned in one of her most dominating games of the year as she scored 21 of her team’s next 29 points – she would finish with 22 points – to get the win. On top of that, Bridgeport’s defense was up to the task. The Indians held Lincoln without a field goal for more than 11 minutes. Marple, who added five blocked shots for good measure, wasn’t alone. Emily Riggs finished the game with 19 points, four rebounds and three assists. Paige Humble had a solid outing with seven points and seven boards. Maddie Wilson added six assists. Lincoln led 15-8 after the first quarter, but Bridgeport would soon turn things around behind Marple. The senior buried a pair of 3-pointers late to put her team in front for good as the Indians held a 24-18 advantage at the half. BHS continued red hot into the third period. The Tribe outscored their hosts 17-8 (41-26 after three) and outscored them in the final quarter as well to coast to the win. “Defensively, I thought the energy was so much better than it has been and we’ve talked about that,” said Hutson. “We gave up 38 points the last time, but they got about seven or eight baskets on back cuts and this time I think they got one. On Monday, Bridgeport had anything but a slow start at Robert C. Byrd. The Indians jumped out to a 16-4 advantage after one quarter and never trailed even though the Eagles did manage to bring the score to 25-15 at the half. In the final two quarters, Bridgeport defense yielded just 10 points. That would be more than enough to get the win. The BHS defense forced 25 Robert C. Byrd turnovers. Although BHS had just two players in double figures, they had a balanced attack. Maddie Wilson led the way with 11 points on a perfect 5-for-5 shooting. Riggs added 10 points, while Humble and Marple both had eight. Wilson’s big game included eight assists and five rebounds. On Saturday, Bridgeport’s senior night proved to be a success thanks to a huge third quarter. 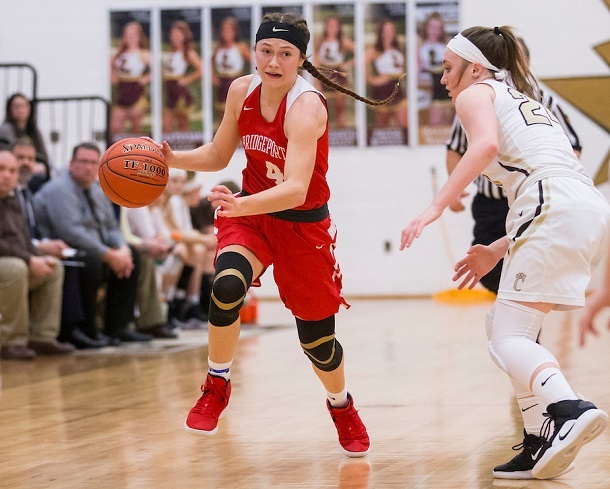 After battling with a Braxton County team that had been playing their best basketball of the season to a 24-23 advantage after two quarter, the Tribe took over in the third. Bridgeport outscored the Eagles by a 22-5 score to put the game away. 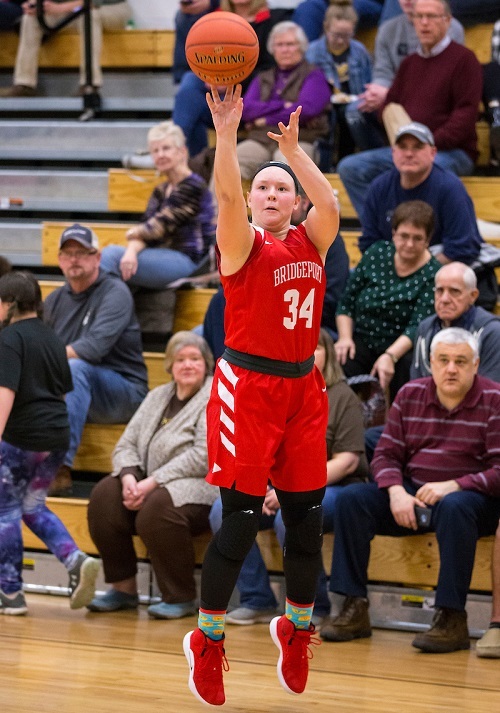 Riggs, who scored 12 straight points at one segment, had a huge offensive night for the Tribe as she led three players in double figures with 26 points. Humble added 14 and Marple chipped in with 13 in the victory. Humble also added seven rebounds. Bridgeport is now off until next Wednesday. 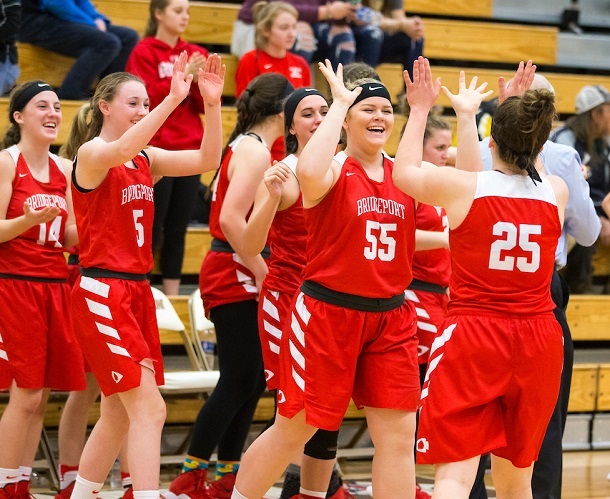 BHS plays its final regular season game Feb. 13 at home against Buckhannon-Upshur. Check back Monday to Connect-Bridgeport for a gallery of photos from the Lincoln contest. Editor's Note: Top photo shows Rory Marple going up for two, while Maddie Wilson looks over Lincoln's defense in the second photo. Third photo shows Emily Riggs pulling up for a jumper and, below, Paige Humble (25) get high fives from her teammats toward the end of Wednesday's game with the Cougars. Photos by www.benqueenphotography.com.